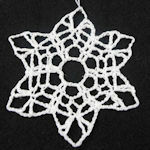 Lacy Chains Snowflake -- A free Crochet pattern from Julie A Bolduc. 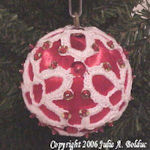 This snowflake is a result of a visitor request. 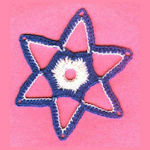 She wanted me to design a snowflake based on the Snowflake Bookmark I designed on this site. I changed the 3rd round then added one more.